Organisations continue to struggle with their strategies; even when they have a strategy development process, their plans rarely have the impact that was intended. Too many of their people don't know about the strategy, don't understand it or can't translate it into what it means for their role. Validating Strategies addresses the taxonomy, syntax and semantics of strategies; in other words: what does the strategy say, how does it relate to other plans, what are the causalities between the strategy and successful business outcomes and how should this all be expressed in a language that everyone in the organization can understand. 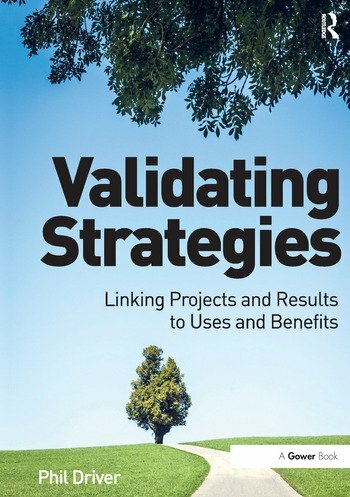 The model at the heart of this book - Organisations run Projects that produce Results and enable people to Use them to create Benefits (PRUB) - offers an intuitive approach that links collaborative strategic planning and validation to project and programme management so as to create, validate and implement strategies. The strategy development and validation model offered by Phil Driver addresses the struggle of organisations to realise their strategy, replacing endless projects that don't quite seem to deliver what the organization needs with an easy-to-understand, implementable methodology that can be validated with evidence. Phil Driver is founder and CEO of OpenStrategies Ltd (Christchurch, NZ). His background in science and engineering management led to his involvement in large-scale industry-sector strategies. That in turn led to his developing an in-depth understanding of the challenges of even larger scale, public sector strategies. The OpenStrategies’ system then evolved through more than a decade of intense engagement with many public and private sector organisations. A fundamental principle Phil applied was that ’anyone can design a complicated strategy system but a good designer will develop a simple one’. The resulting OpenStrategies’ system is compellingly simple yet powerful, even for very complex, large scale strategies. Crucially, OpenStrategies doesn’t just underpin the design of strategies - it also guides their validation and implementation.